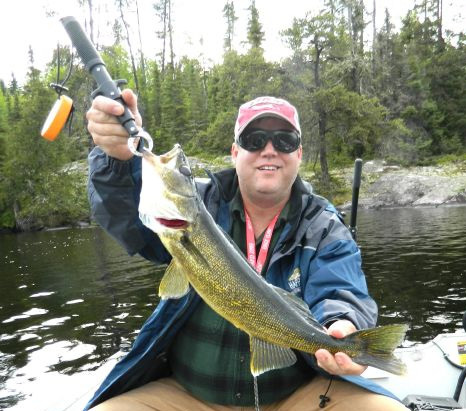 Lake Windermere is the top fishing lake in the Chapleau area and one of the top lakes in Ontario for Walleye, Smallmouth Bass, Northern Pike, Lake Trout and Whitefish. Not only do guests catch high numbers of fish, Lake Windermere is such a nutrient lake that the average size of all species of fish seems to be much bigger than the Ontario average. We also have 5 portage lakesfor those looking for an adventure which gives you the opportunity to immerse yourself into a deeper northern experience. Walleye can be caught in good numbers and sizes. Guests enjoy hitting hundreds of spots on the lake where they are consistently catching Walleyes up to the 4 pound range. Many of our guests come to Happy Day Lodge because they can catch Walleye up to the 10 pound range, which are available but not as common. There are Northern Pike in the lake. It's easy to hit the back bays and catch pike throughout the day. 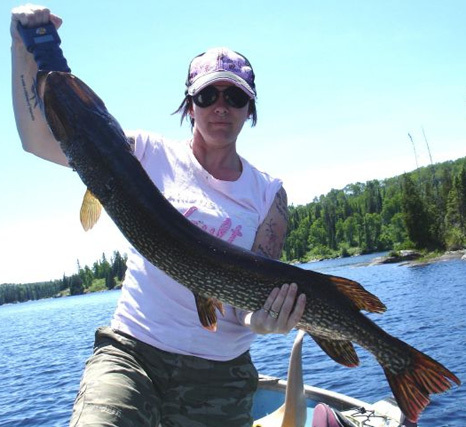 Guests who specifically fish for Northern Pike could catch a Pike up to the 40-inch range. Our lake has 133 miles of rocky shoreline and Smallmouth Bass can be found along it. 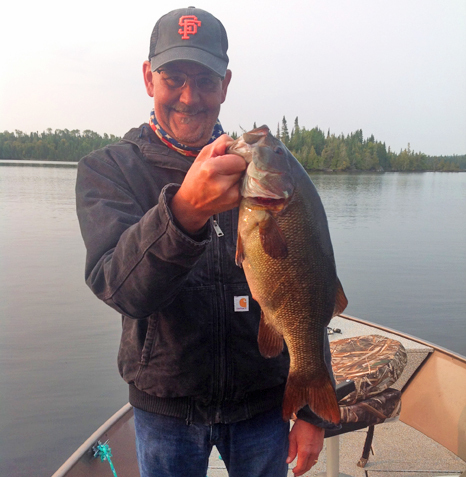 Smallmouth are common in the 1 to 3-pound range and guest catch a surprising amount in the 4 to 6-pound range. 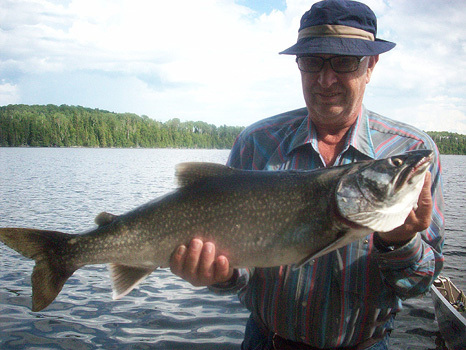 Lake Windermere does have a small population of Lake Trout. They are occasionally caught while fishing for other species. 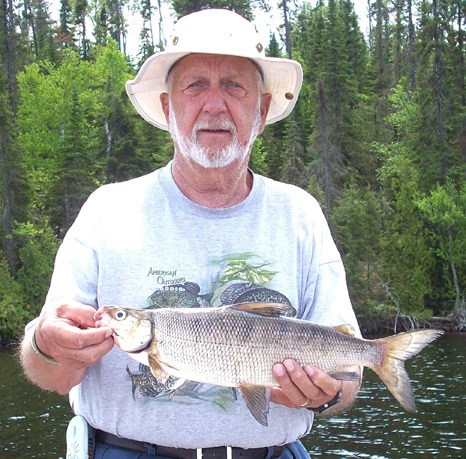 Lake Windermere has schools of Whitefish and in the spring and fall guests have been known to catch many 3 and 4 pounders in just a few hours. We are a Provincial Designated Conservation Reserve Lake. What does this mean? This means we work closely with the MNR biologist and we have rules that protect the breeding stock of Windermere Lake. By protecting the breeders, this ensures that our guests will have a quality fishery and gives our guests a greater opportunity of catching a trophy fish of a lifetime. We encourage our guests to harvest only the non-breeding stock for eating and taking home. Remember, there are plenty enough non-breeders for everyone to fill their limits. Happy Day Lodge has a saying…PROTECT THE BREEDERS & YOU WILL CATCH LOTS OF EATERS! · Each cabin has its own dock located in front of your cabin - post guards, dock bumpers and GFI outlet with extension cords provided for your use. · Generated Electricity - our power supply is limited. We have 9 cozy lakefront cabins, which all have a beautiful view of the lake. The cabins are fully equipped for housekeeping and can sleep between 2 and 8 people comfortably. If you want a complete wilderness setting, we offer accommodations in our remote outpost camp at the far north-end of the lake. Click on Hook the Wild for other outpost/ remote cabin options. We have guided, semi-guided and self-guided big game hunting packages. Our Black Bear hunt takes place in our exclusive BMA, which is hundreds of square miles and your opportunity to harvest a bear in Ontario is great. We have Adult Bull Moose tags for WMU 32 and offer both archery hunting and rifle hunts. Wolf, Grouse and Duck hunting is also available.